It's only been a few months since the epic Season 2 finale of Star Wars Rebels, but fans are already looking ahead to Season 3. For a sneak peek at Star Wars Rebels Season Three, executive producer Dave Filoni debuted a new clip in the latest episode of The Star Wars Show, along with a new photo. This two-minute clip brings back a familiar face we met in Season 2, Hondo Ohnako, voiced by Jim Cummings. The clip, which comes courtesy of YouTube, features Ezra (Taylor Gray) breaking his old partner Hondo out of captivity, along with the rest of the Ghost crew. This scene also reveals that they broke Hondo out, along with an associate who has plenty of secrets, in exchange for some information, but we don't know exactly what the Ghost crew is seeking in this clip. Regardless, their escape turns into a fight for survival as they have to outwit a number of Stormtroopers to make it back to their ship. Feel like you have more questions than answers about what the future holds for the crew of the Ghost? Fear not! Executive Producer and Supervising Director Dave Filoni will be joined by Tiya Sircar (Sabine) and Sam Witwer (Darth Maul) to share highly-guarded sneak peeks at what's to come in Star Wars Rebels Season 3 at Star Wars Celebration in London this Saturday, July 16th. StarWars.com will be livestreaming the Star Wars Rebels Season Three Panel on Saturday, July 16th (4:00 p.m. - 5:00 p.m. GMT / 8:00 a.m. - 9:00 am PT). Fans in attendance will be treated to a screening of the first two episodes! The transformative second season of Star Wars Rebels featured the return of fan-favorite clone troopers Captain Rex, Captain Gregor and Commander Wolffe, and the debut of new characters including the Seventh Sister, a cunning and crafty Inquisitor who is tasked by Darth Vader to track down the rebels. Following a series of critical events, the lives of our heroes will be changed forever as Season Three begins. 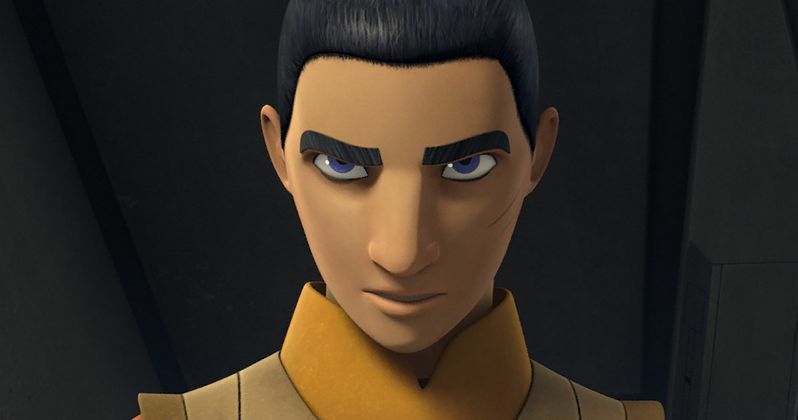 The Season Two voice cast includes Freddie Prinze Jr. as Kanan, Vanessa Marshall as Hera, Steve Blum as Zeb, Tiya Sircar as Sabine, Taylor Gray as Ezra, Ashley Eckstein as Ahsoka Tano, Dee Bradley Baker as Captain Rex, Captain Gregor and Commander Wolffe, David Oyelowo as Agent Kallus and Sarah Michelle Gellar as the villainous Seventh Sister Inquisitor. Star Wars Rebels is created by Dave Filoni (Star Wars: The Clone Wars), Simon Kinberg (X-Men: Days of Future Past, Sherlock Holmes) and Carrie Beck. The Lucasfilm Animation production is executive-produced by Filoni and Kinberg. LucasFilm hasn't revealed when the Season 3 premiere will air, but we expect that announcement to be made at Star Wars Celebration this weekend. While we wait for more details, take a look at this clip and the photo below, which takes place at the 3:40 mark of the video below.